My sweetie hates ric rac–he calls it man lace. But I had this inch wide ric rac that was begging to be put on the tree. 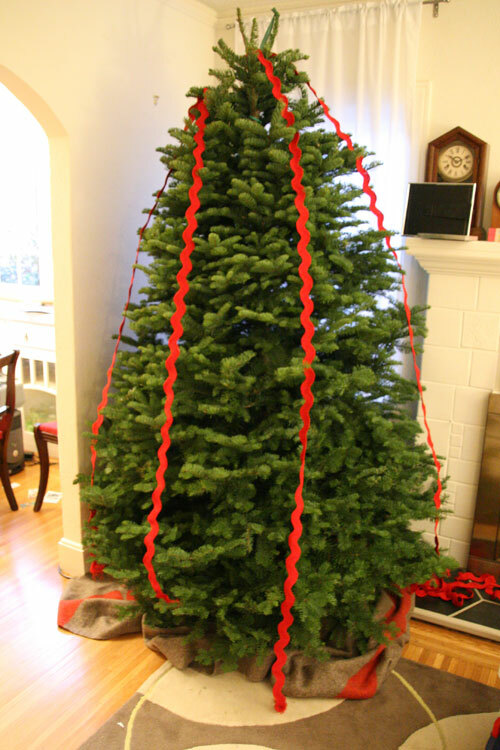 My sweetie allowed me to trim the tree with this ode to all things crafty just long enough to take this picture. I think it’s fab. Or is it fug? 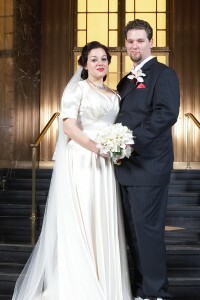 I can’t believe it’s been three years since we said I do, sweetie! Not so fancy this morning when I was nursing our Peach and you reached over and kissed my brow and wished me a happy anniversary. But still just as much love. In fact, more. Much more. I can’t believe that I’m getting ready to cook Thanksgiving dinner already! This will be my fifth year of cooking Thanksgiving and I think I have it down… kinda. I have favorites that continue to show up every year, but always try one new recipe a year. 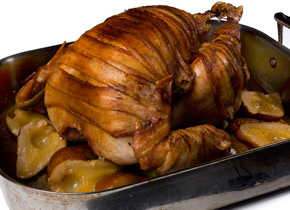 CHOW’s bacon wrapped turkey with cider gravy This is insane–I made it last year and it is now the standard that all other birds are measured. I know bacon is the food trend of the moment and showing up everywhere from cookies to caramel but guess what–BACON NEVER GOES OUT OF STYLE! Butternut Squash Gratin with goat cheese: Not only is this dish insanely good, but easy to make ahead. And it includes hazelnuts. Who doesn’t love hazelnuts? Chestnut, bacon, dried apple and cornbread stuffing: This recipe is so tasty that even my husband, who hates dressing loves this dressing. And it’s a bit of a nod to my own family traditions of a cornbread stuffing. This year, I plan to make my own corn bread from scratch to kick it up a notch! I can’t wait! Mash potatoes: It’s my husband’s thing. But I’m making them according to this amazing video. Cranberry sauce: Once again—Mr. Sweetie is taking the reins on this one. Normally I farm out dessert, although I do love making a good apple pie. And I really want to try this out: tiramisu dip. I know. Right? What are you planning to serve? Although it’s been awhile since I’ve officially zipped up the ole go-go boots, I’m still very much a Devil-Ette in my heart. And I’m so excited to see my ole gal pals in horns hoof it up big time this weekend at the Go Go Spectacular! If you live in the Bay Area, please think about shaking a tail feather with the Devil-Ettes this weekend. You’ll be happy you did! 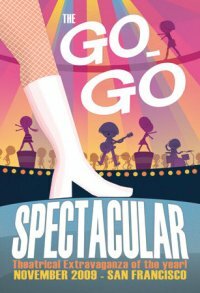 Author Miss DottiePosted on November 12, 2009 Categories UncategorizedLeave a comment on Go Go Spectacular! Oh Sweetie, I’m so glad you are in my life. I’m so glad I see so much of you in our little Peach. Sorry I’m sniffly today, but Zachary’s pizza for a birthday treat isn’t too shabby! I am lucky enough to live a short bicycle ride from one of the best monthly antique/vintage flea markets in the US, but just like city dwellers often ignore their closest museums, I don’t get out as much as I’d like to this wonderful treasure trove of vintage awesomeness. Right now, I just don’t have a Sunday morning to spend leisurely winding my way through the rows of vintage stalls when I have laundry and cooking to do. 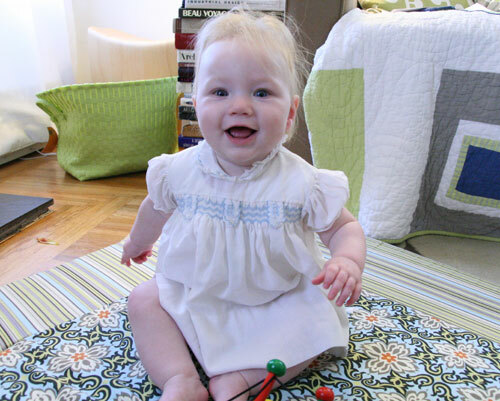 But I do have an hour to go to an estate sale with baby in tow. I come from a long line of tag sale fiends. Some of my earliest memories are of getting out early on a Saturday morning while my mother wrangled a map to find where Pleasant road in Weston was located. Fortunately, my little island home has some amazing estate sales. Like this recent one in a Gold Coast Victorian where a navy captain lived since the 1940s with his wife. A lot of the stuff was rather expensive, but I always head to the same places first–the kitchen and the linen closet. And the best part is that I got both for $2.00! What a steal, eh? I think they are from the mid-30s. I particularly like the rectangle platter. My sweetie and I toasted them with a nice gin and tonic. 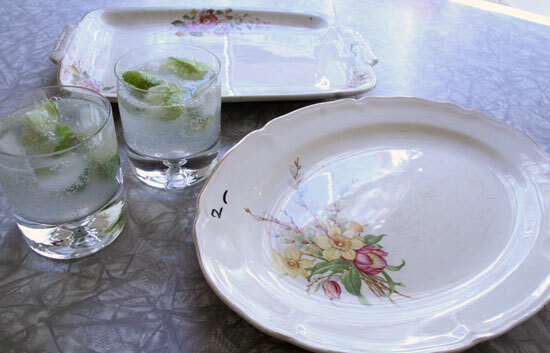 We are on a little G&T kick right now what with all of these fancy tonic waters are on the market, such a our new favorite Q Tonic. We’ll discuss T-Day menus later this week. I am very excited about mine! Oh man this is hilarious. While reading about Modern Family and that insanely scary movie that I’ll never see I found a site that made me laugh so hard that I put my head on the computer keyboard to muffle my voice so the baby wouldn’t wake up. Now, you need to know that I love Etsy. I actually try to buy goods from the site first before I go to others for presents for friends and family. I think the people that sell their wares on Etsy are amazing and I’m so proud to help support them and their lifestyle and with each purchase I am telling the world that hand made goods are an important part of the overall business world. But that Regretsy is hilarious. All good things I guess will be mocked sooner or later. 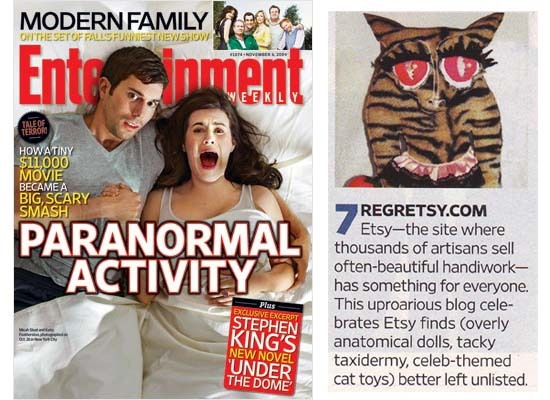 Regretsy is the StuffWhitePeoplelike.com of 2009! I called it now. I gotta say, I love my slow cooker. Every spring/summer the old crock pot languishes in the pantry, completely forgotten until there is that nip in the air. But one read-thru of my sister’s in law cookbook Slow Cooker Cooking, by Lori Brody, well, I had to try the slow cooker again. With recipes as amazing as Moroccan chicken and apricots, boeuf bourginon and lamb you can eat with a spoon, how could I not love this piece of kitchen wizardry. 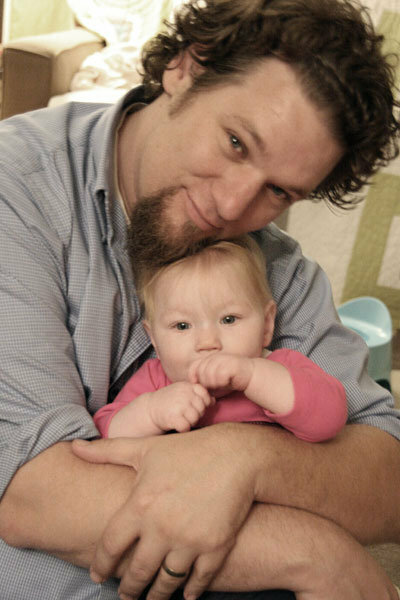 I must admit tho’–these aren’t your typical throw-stuff-in-a-pot-and-walk-away. No, I spend about 15-30 minutes prepping if not longer at times. So, I like to put it together Sunday night and cook it Monday day, coming home to a cooked meal that can feed us for at least two nights. 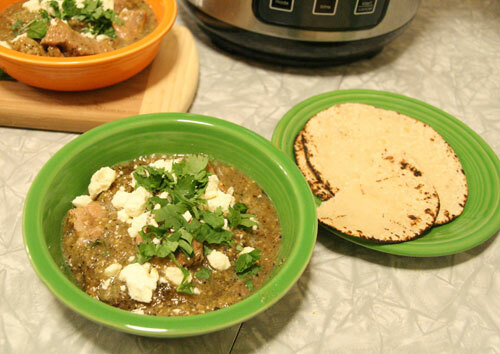 My new favorite recipe is Pork Stew in a tomatillo sauce, from a new slow cooker cookbook called The Gourmet Slow Cooker: Simple and Sophisticated Meals from Around the World which features different recipes from around the world. Please note simple does not mean easy. Unless you consider hand roasting 3 lbs of tomatillos easy. 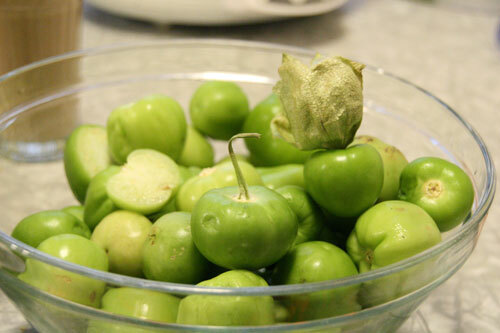 It was my first time cooking with tomatillos and I’m still shocked at how cheap they were. And I’m still shocked at how unbelievably good that stew is! Topped with a little feta (I couldn’t fine queso to save my life!) and a bit of cilantro. So perfect for a cool fall evening. And already she’s doing military style push ups. And POOPING ON THE TOILET. Seriously! Have you heard of Style Rookie? 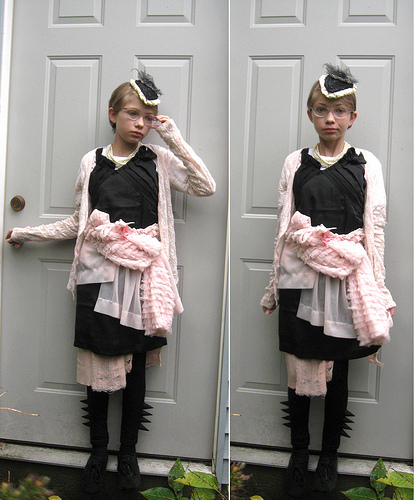 It’s this brilliant fashion blog by a 13 year old. Yes, that is correct. When was thirteen, I thought the height of fashion was frosted pink lipstick. I was more interested in that baggy shaker knit mustard yellow sweater I saw at the Limited the last time my mom drove me to the mall than having an opinion on the spring 2010 Steve McQueen shoe collection. And certainly I didn’t think I was cool enough to even think of this outfit, let alone wear it. And here is Tavi rocking it out. It really saddened me when I read on her blog that she sometimes is made fun of in her school for the way she dresses. But she is confidently doing her own thing and I respect her great self confidence to live her live and dress the way she wants. And she found people who appreciate her unique take on style through her blog. Man, being a teenager is tough enough–there is such pressure to fit in. But I salute anyone who wants to march to their own drummer and be as joyous in it as Tavi. I’m buying my Team Tavi t-shirt tomorrow!